Our mission is to maintain our global leadership position in proofreading software and services for regulated industries. We strive to provide high quality, user friendly text and graphic verification software that meets our customers' specific needs and requirements. Schlafender Hase GmbH was founded on May 1, 2001, by Frank Hessler (Managing Director, Programming) and Willie Schnaubelt (Managing Director, Customer Service). It began as a traditional advertising agency with a focus on new media, like inter- and intranet. One of its first customers was the pharmaceutical company Aventis. Aventis asked if there was a tool that could compare text from original text manuscript to the text in artwork ready for print, regardless of layout. The original idea was to integrate packaging information into the company’s intranet system. Schlafender Hase’s answer: the Text Verification Tool (TVT). TVT changed Schlafender Hase and Schlafender Hase changed the way the pharmaceutical industry proofreads the materials it needs for leaflets, labels and packaging. The first version of TVT was developed in 2003 and went to market in 2004. The name Schlafender Hase was initially an internal code name. The name stuck. It means “Sleeping Hare”, which doesn’t mean that the hare has been sleeping. For virtually all of the world’s leading pharmaceutical companies Schlafender Hase’s TVT has come to mean easy, efficient and accurate proofreading of any text in any language. As the world’s most highly regulated industry has developed, so, too, has Schlafender Hase developed TVT. The newest version of TVT, TVT X, was introduced in 2018 and is now able to compare images with the same speed and accuracy with which it can compare text. The company’s global headquarters is in Frankfurt. It also has an office in Cambridge, Massachusetts, to better serve its North American customers. Since its foundation in 2001 Schlafender Hase has continued to grow. It is currently developing new modules for TVT and looking to enter additional industries that need efficient and accurate ways to proofread their materials. In 2017 Willie Schnaubelt retired and Wieland Capital, a family office, headquartered in Munich, became a shareholder of the company. Frank Hessler continues to lead the company as Managing Director. The common goal of Schlafender Hase and Wieland Capital is to preserve Schlafender Hase’s unparalleled product and service quality. Today we have two office locations, Frankfurt, Germany and Cambridge, Massachusetts, USA that serve all of the top 15 global Pharmaceutical companies and more than half of the top global Medical device companies. Our team of committed, talented and reliable people is truly what allows Schlafender Hase to continually grow and help more companies eliminate text and graphic related errors. We are proud of what we do and hope to work with you soon. Below is our outward facing team who you may speak to on the phone, or meet at trade shows and trainings. 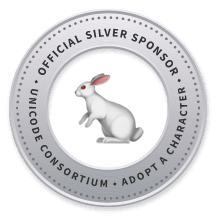 We have adopted the Rabbit Unicode character from the Unicode Consortium. We choose the Rabbit Unicode (U+1F407) since our company name means ''Sleeping Hare''. The Unicode Consortium is an organization that enables people around the world to use computers in any language.